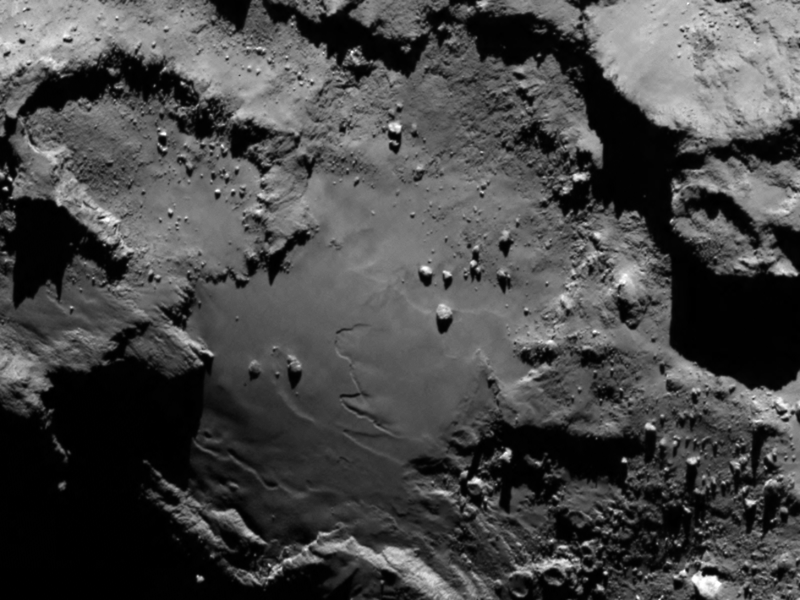 The image was taken by Rosetta's Onboard Scientific Imaging System (OSIRIS) on August 6, 2014. The image clearly shows a range of features, including boulders, craters and steep cliffs. The image was taken from a distance of 80 miles (130 kilometers) and the image resolution is 8 feet (2.4 meters) per pixel. 2.4 meters! That's amazing. Here's a general shot, still way more detailed than anything captured ever before. It truly looks fascinating, and it's only going to look more amazing: In November Rosetta will launch a robotic probe called Philae to land and take the first images from the surface itself. It will also drill into it to learn more about its composition. This is very exciting, as comets are believed to carry important information about the origins of the Solar System and life itself. Rosetta also will be the first spacecraft to witness at close proximity how a comet changes as it is subjected to the increasing intensity of the sun's radiation. Observations will help scientists learn more about the origin and evolution of our solar system and the role comets may have played in seeding Earth with water, and perhaps even life.